Most animals alive today are bilaterians, and have key characters such as bilateral symmetry, anteroposterior asymmetry (i.e. distinct front and back ends) and dorsoventral asymmetry (a distinct top and bottom). Modern bilaterians include all worms, chordates, molluscs and echinoderms, and they are very diverse. Several Ediacaran taxa possess bilateral symmetry and distinct front and back ends, and have been suggested to be bilaterian. However, with the exception of the mollusc-like fossil Kimberella, due to limitations in preservation, it is difficult to know whether the fossil organisms also had dorsoventral asymmetry. 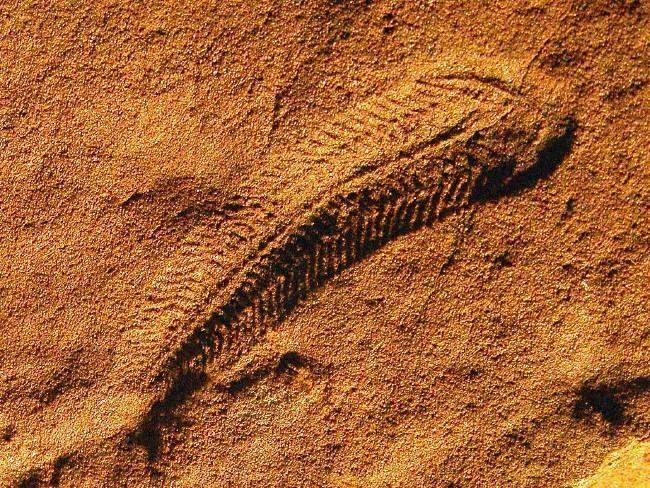 As a result, describing such organisms as bilaterians is a controversial topic among Ediacaran palaeontologists. Candidate bilaterian Ediacaran organisms include several unusual and enigmatic taxa, such as Dickinsonia, Kimberella, Parvancorina and Spriggina. Little is known about how many of these organisms lived, for example what they fed on, how they reproduced, or what processes their life-cycles involved. Their bilateral symmetry and anteroposterior differentiation suggests that they might have been able to move, although trace fossil evidence for movement has only been described among Dickinsonia and Kimberella so far. The bilaterally-symmetrical Spriggina floundersi, from the South Australian Museum, Adelaide, Australia.